There's not a more basic wardrobe staple than a t-shirt and jeans. They're comfortable and easy. They can be dressed up or dressed down. They're just something everyone needs. Yesterday, I took L to dance and K and I went shopping. We wandered into Ross and headed to the juniors department. Which made me wonder when the child got big enough to wear juniors? We flipped through the racks and found a couple of t-shirts she liked and then we found a pair of jeans. When she walked out of the dressing room, I was shocked to see how grown-up my little girl looked. Today I offer you a series of photos. 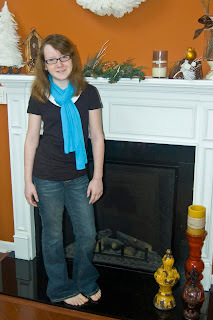 Photos that show her evolution in jeans and a t-shirt. She got this set for her first birthday. I love this age as you can dress them however you want. Overalls. 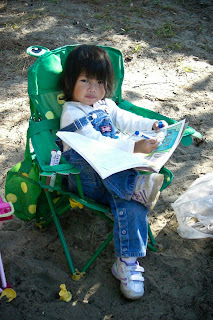 She liked overalls and the pink flowered t-shirt. Look at those chubby little arms! I remember thinking how much older she looked in this picture. Overalls again. 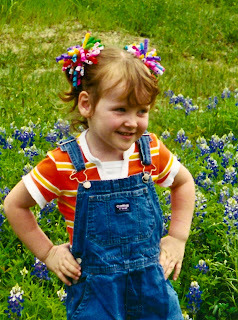 And she still let me put frilly, colorful bows in her hair. Doesn't she look sassy? I love her little dimpled knuckles. 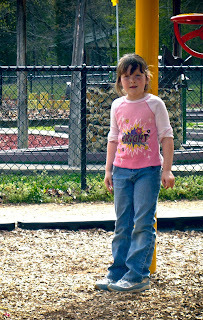 Okay, so she was actually 6 here. 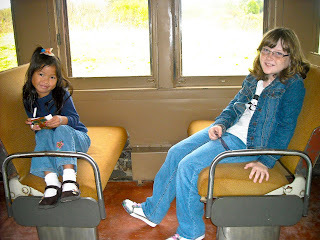 She went through a phase where she wore mostly track pants and shorts and it was hard to find good pictures of her in jeans. And the overalls make another appearance. 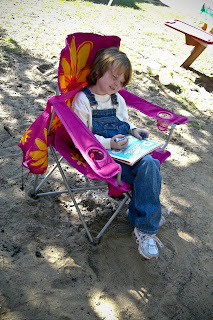 Comfy, warm, great for coloring at the campsite. And she was still excited that Lydia wanted to be just like her. See? 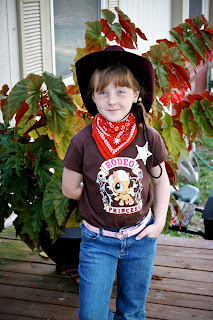 Jeans and t-shirt make a good Halloween costume. Now clothes are becoming a little more important. 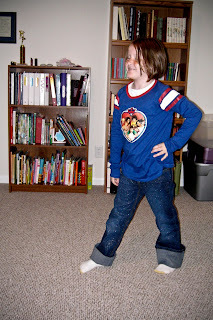 The jeans are *glittery* and the shirt is High School Musical, but still relaxed and sporty-looking. Yep, we're growing up and looking a little more put-together even with baggy jeans and denim jacket. Oh, look. A complete outfit. 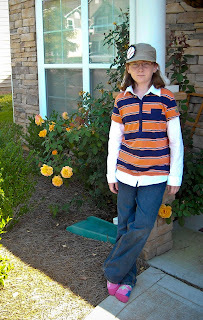 Comfy baggy jeans and a preppy shirt with a hat thrown on to complete the casual look. This is her look today. Fashionable dark-rimmed glasses, slim-cut jeans with requisite fading and heavily-detailed back packets, fitted t-shirt with a low round neck layered over a white tank with a bright scarf to finish off the ensemble. Where did this mature, slim, tall, young woman come from? When did she start caring more about style and less about comfort? 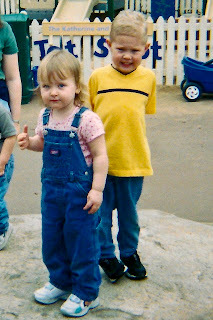 When did the track pants and overalls get replaced? We were even discussing flat irons for her hair today! She's still just 10 and she still often wanders around in ripped jeans and an old hoodie, but the elegant girl pictured above is showing up a little more often these days. Oh Valerie, there are more changes to come. 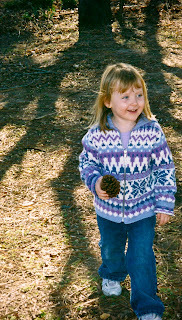 It is exciting and wonderful to see your little girl grow up into a Godly young lady. What treasures your young ladies are and I can't wait to see how God continues to grow them into young women. 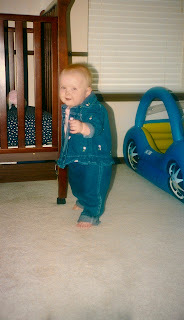 Love the photos - I need to make sure Beth sees them, she will get a kick out of a couple of the baby photos of Kate.